Lawrence Okolie successfully defended his World Boxing Association (WBA) Continental Cruiser-weight title, scoring a third round knockout victory over Hungary’s Tamas Lodi Saturday night at the O2 Arena in London. Okolie repeatedly floored his Hungarian opponent before the fight was waved off by referee Howard John Foster, setting up a showdown with Commonwealth title holder Wadi Camacho at the Copper Box Arena on March 23. 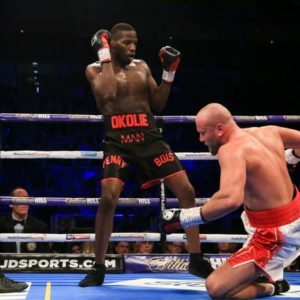 Okolie and the Spanaid were expected to fight but both parties could not agree on terms and both men traded heated words following a face-off in the ring. Okolie is undefeated in 11 fights (8 Knockouts) while Camacho has won 21 fights (12 knockouts) and lost seven. Rasheed ‘Afonja Warrior’ Abolaji, fighting at the same venue with Okolie, lost the vacant Commonwealth (British Empire) Middleweight title to Felix Cash. The 27-year-old Lagosian was quickly overpowered by the unbeaten 25-year-old Briton and was on the canvas twice before the referee Marcus McDonell ended the one-sided affair in the first round. This is the second time Rasheed Abolaji has failed to win the vacant belt. He lost to Sam Sheedy by unanimous decision in his first attempt in Sheffield last year.